Combined heat and power (CHP) is the dominant form of microgrid technology now, but solar energy threatens to usurp its position by 2026. 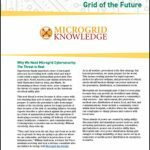 That’s the word from Navigant Research in its new report, Microgrid Enabling Technologies Market Overview. The report finds that among generation technologies deployed within microgrids, CHP leads with 655 MW, followed by solar photovoltaics (392 MW), and then diesel (385 MW), based on global 2017 figures. By 2026, the landscape is expected to shift with solar jumping to a commanding lead with 3,786 MW annually, followed by energy storage with 3,292 MW, according to the report. The report also forecasts that global cumulative spending will reach $112 billion by 2026 on eight microgrid enabling technologies studied: biomass, CHP, diesel, energy storage, fuel cells, hydroelectric, solar PV, and wind. A way to aggregate and optimize distributed energy, the microgrid platform challenges the status quo by allowing for new levels of resilience and reliability in light of emerging threats to global power grids, ranging from extreme weather events, earthquakes, and wildfires to terrorist threats, according to Navigant. At the same time, microgrids can help organize mixed asset fleets of distributed energy at the distribution network level, Navigant notes. With the right set of control technologies, this platform can not only offer value streams to site hosts, but also provide value upstream to the larger grid. Vendors discussed in the report include: ABB, Eaton, S&C Electric, DG Innovators, Caterpillar, Cummins, Tecogen, Energy Storage Innovators, Tesla Energy, ViZn Energy, Younicos, Controls Specialists, Opus One Solutions, Optimal Power Solutions, Schweitzer Engineering Laboratories and NUVVE. Join us in Chicago at Microgrid 2018, May 7-9.